This professional tea tasting set is perfect for the tea lover who wants to take their connoisseurship to the next level. Tea professionals rely on their keen palates and extensive knowledge to compare and rate teas of different grades and qualities. To do this reliably, however, the tea industry has developed a standardized method for tasting to insure that different lots at different times are tasted consistently. 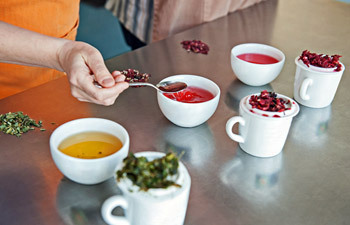 This process is referred to as “cupping” and includes a tea tasting set such as this. The three-piece porcelain set includes a cup, lid and bowl. To use simply place 2.5 grams of loose leaf tea in the cup. Then, fill the cup with boiling water and cover with lid. Steep for three minutes. While holding the lid on tight, pour the water from the cup into the bowl. Be careful, as the porcelain can be hot. To do this in a relatively hands-free method, tip the cup (pouring hole down) into the bowl with the lid on. Rest the cup on the top of the bowl diagonally with the handle of the lid resting on one edge of the bowl and the bottom of the cup on the opposite edge. Once the water has completely drained from the pitcher, evaluate the visual and olfactory characteristics of the infused leaves and brew before tasting the brew itself. For details on how to conduct your own tea tasting, visit our step-by-step guide on How to Conduct a Tea Tasting.